We reviewed the Surface Pro 4 and liked it a lot. Well, that was then. And a different reviewer. I'm going to get this out of the way now, because it underpins the rest of the review: Surface Pro is a fascinating stab at a hybrid of laptop and tablet. Having used it for several days, I'm at a loss as to why most people would buy it over a proper laptop or a high-end iOS or Android tablet. One grouping I would recommend this year's Pro to, pretty much unreservedly, is visual creatives. Artists and designers should love the beautiful screen, Surface Pen and Surface Dial compatibility and the ability to angle it like a sketch pad. The Pro's own design is a bit of a mixed bag, though. There are some fantastic elements but also some quite fundamental flaws. The main problem is that it is a Windows 10 tablet, and Windows 10 remains a less than perfect tablet OS. For all Microsoft's sterling efforts, in most apps it remains a desktop OS that's had a touch skin applied to it. Actually, that's only the second biggest problem for the Surface Pro as a tablet. The premier issue is that it's too heavy to easily use in the way you'd use an iPad or Android tablet. I'm not trying to imply it's too heavy to lift, and yes, it's a hugely powerful device, with a screen that's 12.3 inches across. But it weighs in at at least 768g for a model powered by an Intel m3, up to 784g with an i7. The iPad Pro 12.9-inch is under 700 grams. Add the Surface Type keyboard (for £125 rrp) and the weight is 1.1Kg, which is somewhat more than most flagship, slimline laptops these days. Now, I've read plenty of other reviews of the Surface and they all say the keyboard is really good, considering it's incredibly slim and essentially made of a kind of plasticky fabric. However, I have another take on this, which is that as a keyboard, per se, it is really pretty poor. Yes, it's a fantastic achievement when you consider its dimensions and what it's made of. But Microsoft has got so bogged down in making the best possible super-slim, magnetically-attaching, plasticky fabric keyboard that it's missed the obvious point: it'd just be better off using a metal keyboard. Once you get past these flaws, the Surface Pro is a beautifully designed thing. The way the (slightly iffy) keyboard attaches to the (too heavy) tablet screen is quite brilliant, and as an exercise in trying to pretend that a full-powered laptop is really a tablet, the Surface Pro is as good as it gets. The screen to bezel size ratio is perfectly judged, the kickstand is superb, allowing a viewing angle from a near-upright, 85 degrees or so, all the way down to a sketch-friendly, just-off-the-table. The styling and materials used are also very pleasing, very premium in feel. For all my reservations about Surface Pro, I think Microsoft has pulled off some kind of miracle in outdoing Apple when it comes to aesthetics and features aimed very squarely at the creative community. As a writer member of said creative community, I will happily say that I would really rather not use Microsoft's keyboard. However, as it has included not only Bluetooth 4 but also a proper USB port, I could use it with any keyboard I please. For a reason I cannot fathom, the Surface Laptop comes, by default with Windows 10 S. The Surface Pro runs full Windows 10 Pro so, yes, I have actually written this review on it; something that was, for technical reasons, impossible on Windows 10 S.
Nearly all Windows accessories and all its bazillions of apps are available to you, via the official App Store and desktop downloads, and that is fantastic. You can run Steam, and I managed to get Left 4 Dead 2 running pretty happily on it. Try that on an iPad. Here are the statters that matter. There is enough power on offer at the top end for most things short of more recent games and pro, long-form video editing. Cameras Windows Hello face sign-in camera, 5.0MP/1080p front-facing and 8.0MP/1080p rear-facing autofocus camera. As on previous models, there is support for the excellent Surface Pen (£59). This is 'soon' (date TBC) to be joined by a higher-spec Pen at £99, which will offer near zero latency and four times the pressure sensitivity. The existing Pen, in conjunction with Microsoft's Ink suite, is excellent. There's no 4G connectivity at launch but this will apparently be added later in the year. The m3 and i5 models are now fanless and are said to be near silent as a result. I've been using the i7 and though it does still employ a fan, it is very, very quiet. 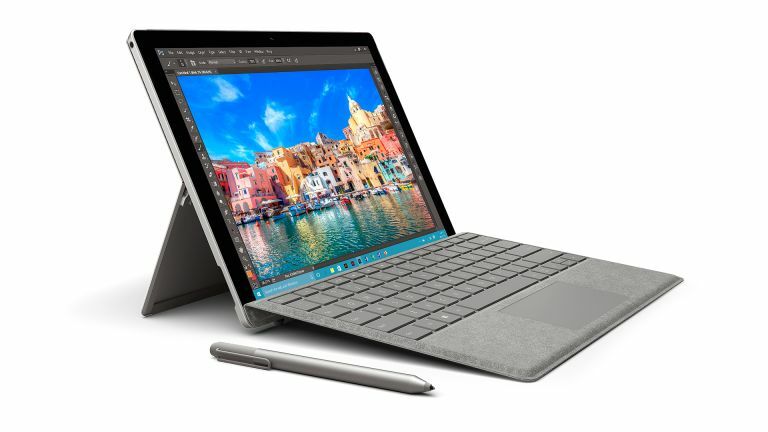 You will need to add the price of the keyboard (£125 for standard, £150 for one coated in Microsoft's favoured Alcantara fabric) to these, and probably a further £59 for the Surface Pen. Pricing is exactly in line with the Surface Laptop which, obviously, comes with a keyboard built in. To me, the Surface Pro seems like a proof of concept. Can a very powerful Windows laptop be turned into a tablet? Turns out it can. However, given this is version 5 of the Surface Pro, and sales to date have been measured in the low billions of dollars, clearly there are people who love these things. If that includes you, I doubt you could fail to be impressed by this extremely powerful, handsome new iteration.